I got into hard & heavy music since I was 13. KISS was the band and it's been downhill ever since. I try to keep up with the latest trends and musical going-ons and I remember the 1st time I heard MINISTRY. It was 1989 and a guy I knew played me the song "Thieves". I'd never heard anything quite like it. Electronic drums, samples, and an angry thrash metal meets punk rock vibe going on. I was hooked! Fast forward to the 21st century. Band leader Al Jourgensen has retired more times than Ozzy. And like Ozzy, Al is still releasing music. From Beer to Eternity is the latest opus from MINISTRY. I already like the title, but what about the music within? Starting off with "Hail to His Majesty", it doesn't hit you in the face like Thieves did. It does however have the samples and industrial soundscape their known for. It's a rather bizarre song honestly, a sludgy electronic acid trip. "Punch in the Face" brings the heavy guitars and anger back to the forefront, but still has a lot of electronic moments and samples. Fans of RAMMSTEIN would flock to this I believe. "PermaWar" is a crushing rifferama that's a fist-in-the-air with a memorable chorus. Slow and brooding, this reminds me of PRONG a bit, who I really dig. "Perfect Storm" is another slower, heavier numbers with low, guttural vocals by Al. And if for some reason you think Al's lyrical stance has softened somehow with age, think again. All things that make this world a dark, confusing place, that is Al's domain. There's even a little speed on the end of "Perfect Storm". Killer track. "Fairly Unbalanced" is about Fox TV and it's political stance, or lack thereof. Plenty of political samples with a up-tempo track behind it. "The Horror" is electronic all the way thru, samples galore with a very disjointed backbeat behind. Rather unnerving at loud volumes to say the least. "Side FX (including Mickey's Middle Finger TV 4)" is electronic thrash, in your face. Reminiscent of Thieves it is angry, aggressive and a total MINISTRY acid trip. "Lesson Learned" has an almost 70's feel, with the female harmony vocals and background guitar. As close to Classic Rock as Al will ever get. "Thanx But No Thanx" is more samples, with an almost reggae backbeat, Eventually turning into a heavy riffing headbanger. Thanks for the drugs, eh Al? "Change of Luck" has an almost oriental / middle eastern flavor to it, only MINISTRY style of course, with samples and electronics galore. But in case you thought this would be a chill song, a great heavy riff kicks it up a notch as Emeril would say. The chorus has a sort-of PINK FLOYD-ish vibe to it, before the heaviness kicks back in. An epic track to say the least. "Enjoy the Quiet" is anything but,sounding kinda like the ocean thru an amplifier at first before becoming just samples and noise before ending with a voice that reminds me of the narrator on THE OFFSPRING's Smash album. So there you have it. 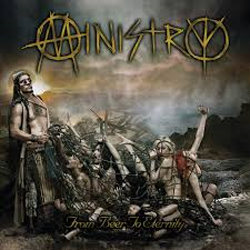 MINISTRY is one band that really defies description and genre affiliation. They really do their own thing, and always have. A mish-mash of different styles, genres, music, samples, industrial noises and electronics. I can't say this is for everybody, but if you've never heard them, I hope this review will pique your curiosity enough to check it out.